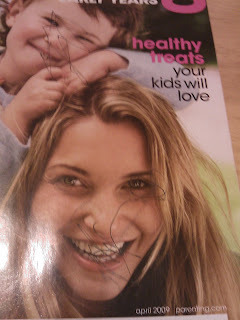 Give a 2-year-old a pen and some unsupervised time with Parenting magazine. Sit back and enjoy the zany result. Instant poor hygiene. Cute. I can't read your Fringe post yet b/c I haven't watched. And I'm SURE mine is cut off. Grr.